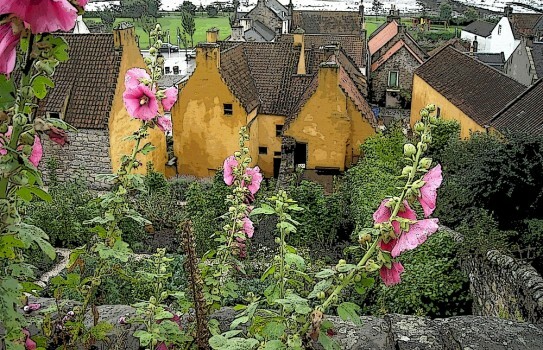 The garden at Culross Palace has been restored and incorporates many of the features which would have been found in the 17th century. It is set behind the property on a slope and also has terraces with great views of the Firth of Forth. The main garden is full of vegetables, herbs, aromatic plants, flowers and fruit. There is also a small orchard with apple, mulberry, quince and fig trees. A flock of 'Scotts Dumpy' hens roam here, much as they would have done in the 17th century. Although the garden is not large it is well worth a visit and take time to visit the Palace too. Garden: all year, please see website for more details. Palace, Study, and Town House: see website but normally from lateMarch or early April. Disabled access difficult. Please ring. Guided tours of other properties in Culross. If you want to find places to stay near Culross Palace and Garden, why not stay in one of our recommended hotels. Each hotel has genuine guest reviews enabling you to book from anywhere in the world in total confidence. Not only do we feature hotels near the garden, we also feature hotels worldwide and at all major airports. Special prices up to 70% off standard rates as well as hundreds of exclusive deals. Look now for hotels near Culross Palace- click here.